After months of planning and loads of preparation ... Hobohome is back on the road again. We left our property at Mt Perry at 1:30pm today (about one and a half hours behind schedule) and are currently slowly heading south. 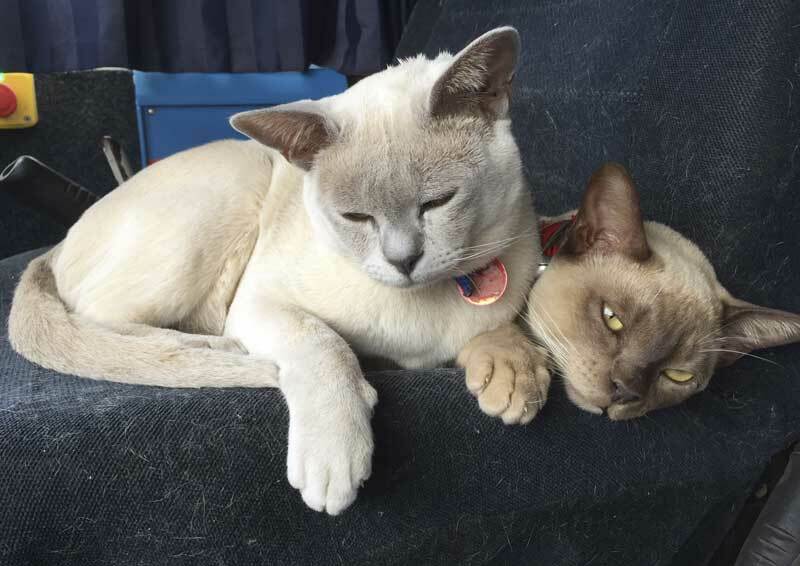 Those who have been following our travels for a few years will know that we originally took to the road in Hobohome (way back in 2003) with our two Burmese cats. We lost Porcha quite early in the journey, but Tivoli enjoyed more than 10 years of exploring the big country. We lost Tivoli (at the ripe old age of 15) last year. To keep us company on this next leg we have two brand new Burmese travelling companions. Introducing Tirrian and Ty - The Travelling Burmese Brothers. Same parents, six months between them - but very different personalities. Tirrian is fairy used to the bus - he lived in it with us for a few months before we finished the shouse - he was however a bit surprised when it moved! To Ty, (the younger of the pair) its all new, but he seems very relaxed about the whole thing. Questions (I hear you ask) ... what are our plans? ... where are we going? ... how long will we be away? Be sure to keep an eye on our Spot Real Time Location Map - you may just know where we are before we do!